Coming to prominence in the 1950s, Farlow played a major role in implementing the, then new, vocabulary of bebop. The technically demanding requirements of negotiating this innovative form of jazz were not insurmountable in Tal's capable (and very large) hands. He and his counterparts, like Barney Kessel, Jimmy Raney, Wes Montgomery, et al, were all striving forward with the innovations pioneered by Charlie Christian, who died prematurely at 26 in 1942. The impressive discography comprises 48 of the somewhat spartan 112-page book. Each of his 34 recordings as a leader, in addition to his many recordings as a sideman, are listed providing copious details of everything including personnel, recording dates and locations. The author has obviously spent extensive time in his research resulting in an unparalleled treasure trove for practitioners and laypersons alike. 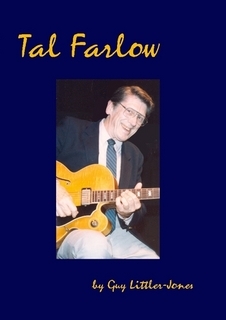 This unique and invaluable book on one of the great (and somewhat unsung) jazz guitarists is highly recommended for any reader keen to be enlightened on the mastery and importance of Tal Farlow.